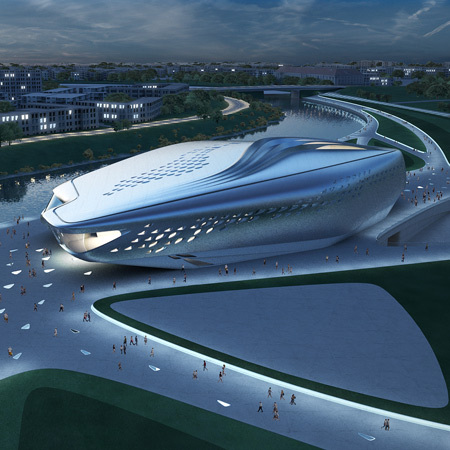 Zaha Hadid Architects have won a competition to design the Guggenheim Hermitage Museum in Vilnius, Lithuania. The competition was part of a feasibility study by the Guggenheim Foundation and the State Hermitage Museum of St. Petersburg, Russia. Architects Daniel Libeskind and Massimiliano Fuksas also submitted proposals. 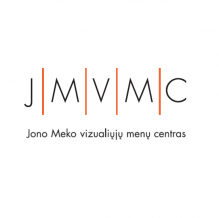 All three submissions will be on display at the exhibition Imagining the Future: Design Proposals for a New Museum in Vilnius at the Jonas Mekas Visual Arts Center in Vilnius from today until the end of June. 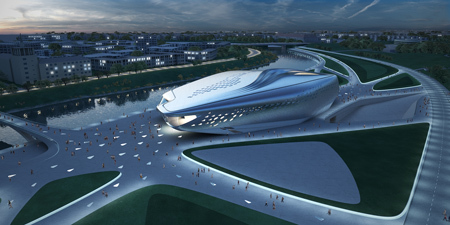 Zaha Hadid Architects are delighted to announce the winning design for a new museum and cultural centre in Vilnius. The new centre for international art will house pieces from collections of both the New York based Solomon R. Guggenheim Foundation and the St. Petersburg based State Hermitage Museum. A six member jury including Lithuanian Prime Minister Gediminas Kirkilas, Hermitage Director Mikhail Piotrovsky and Guggenheim Director Thomas Krens awarded the project to Zaha Hadid Architects at a press conference in Vilnius this morning. The international competition for the project was between Zaha Hadid Architects, Studio Daniel Libeskind and Studio Fuksas. The museums sculptural volume is designed along Zaha Hadid’s characteristic conceptual terms of fluidity, velocity and lightness. The building appears like a mystical object floating above the extensive artificial landscape strip, seemingly defying gravity by exposing dramatic undercuts towards the surrounding entrance plazas. Large activated green fields flow around the museums sculptural mass, underlining its enigmatic presence with curvilinear lines echoing the elongated contours of the building. Contrasting with the vertical business district skyline it is a manifestation of Vilnius’ new cultural significance. A glossy metallic building envelope registers the underlying main programmatic units which are articulated as inlays within the compact overall form. The sub volumes are expressed through folds and protrusions in the facades modulation, creating multiple ways of reading the building as a whole that is constituted by its integral parts. These parts reflect the various institutions and bodies that are combined within the museum, such as the Hermitage, the Guggenheim as well as the city of Vilnius. In the interior a canyon like air space allows for architecturally refined communication and circulation spaces mirroring the Fluxus spirit of informality and vivacity surrounding art. Through manipulations of the ground at the riverfront, towards the park and the bridge, different levels are made accessible. An intensification of public life at the river is our aim. The positioning of the building on the riverbanks, respectively the cities edge, creates a strong sense of place within Vilnius. The exterior spaces are modulated landscape formations creating several imprints or plinths upon which various activities and performances can take place. Large Stairs at the promenade might function as outside auditorium spaces for summer screening etc. The surrounding landscape is a continuation of the internal landscape connecting museum Lobby with its surrounding on several levels. The aim is again an intensification of public and cultural life on the museum plaza and the museum promenade. 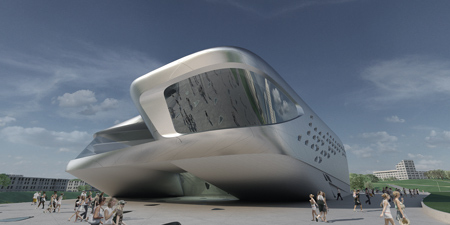 Zaha Hadid’s design points towards a future architectural language matching the cultural aims of the new Hermitage Guggenheim Vilnius Project. It is part of an innovative research trajectory within ZHA that embraces latest digital design technology and digital fabrication methods. The application of advanced digital technology throughout the course of the project enables a seamless workflow from the fluid shapes of the drawing board to the realization process. An innovative architectural language meets new technologies in order to articulate this project’s complexities. 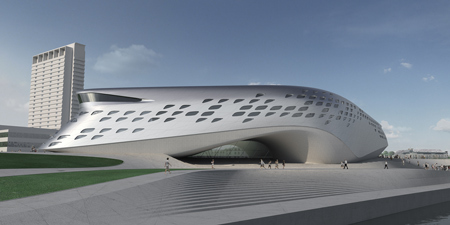 By means of ZHA’s characteristic dynamic acceleration curves and sculpted surface modulations the design expresses the project’s vision coherently. An object reminiscent of a rough diamond shape is placed on the Neris river’s edge. 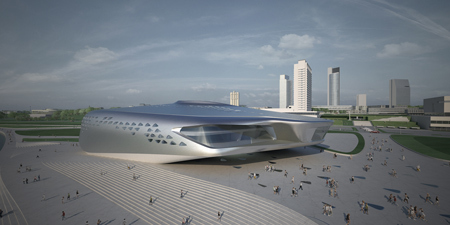 The enigmatic building appears mystically floating above an extensive landscape strip. Large fi elds fl ow around the museums sculptural mass, underlining its presence with curvy- linear lines echoing the volumes contours. As a counterpart to the vertical structures of the northern business skyline, the Museum stretches out horizontally. Its dynamic elongated figure contrasts with the tower structures – a manifestation of this new cultural highlight named the Guggenheim Hermitage Museum. It contains the three main programmatic units which are articulated as inlays within the compact overall envelope. The sub volumes are expressed through folds and protrusions in the envelopes modulation, creating multiple ways of reading the building as a whole that is constituted by its integral parts. These parts reflect the various institutions and bodies that are combined within the museum, such as the Hermitage, the Guggenheim as well as the city of Vilnius. The sub volumes leave canyon like air space in between allowing for architecturally refined communication and circulation spaces. Through manipulations of the ground at the riverfront, towards the park and the bridge, different levels are made accessible. An intensification of public life at the river is our aim. The occupation of the cities edge creates a strong sense of place and within Vilnius.